And we’re back. 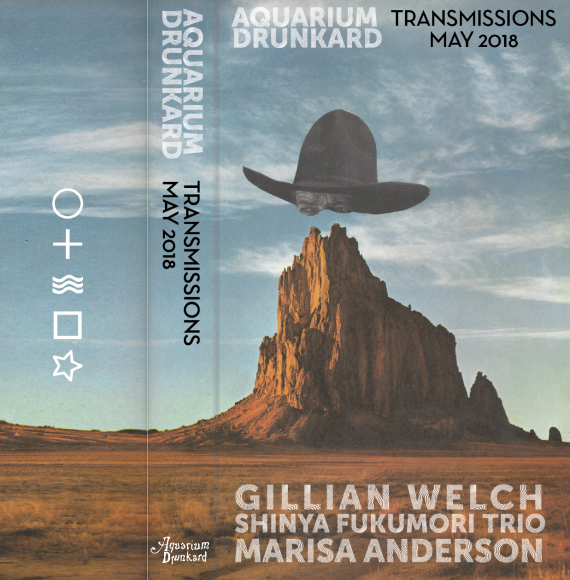 Welcome to the May edition of the Aquarium Drunkard Transmissions podcast, our recurring series of conversations and audio esoterica. 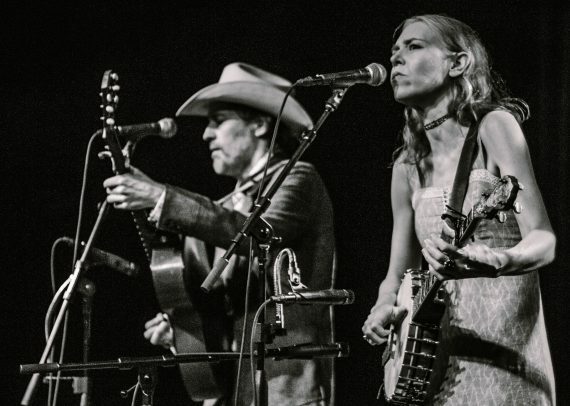 On this program, we’re joined by singer/songwriter Gillian Welch. Along with her partner David Rawlings, Welch has tapped into the wellspring of American vernacular music. Her masterful albums – including 2001’s Time (The Revelator) and 2011’s The Harrow & the Harvest – are part of one of the strongest bodies of work in the modern folk music canon. Welch is about to hit the road with Rawlings, embarking on a series of “An Evening With” dates June through October, and this summer sees the vinyl reissue of her 2003 LP Soul Journey. We spoke to Welch via phone about her attention to the long player, album-length statement, and how it’s resulted in such fine lps. Then, we have a review of the release by the Shinya Fukumori Trio, For 2 Akis by writer and Footfalls Records founder Leah Toth; released by the stalwart ECM label, the new release unites players from France, Germany, and Japan for a quiet, but subtly immersive new album, produced by ECM mastermind Manfred Eicher. 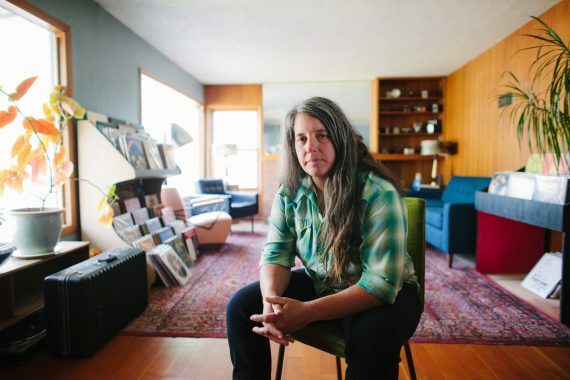 And to close out this month’s episode, a conversation recorded live backstage with guitarist and composer Marisa Anderson. She’s one of the most engaging solo players in the field today, blending blues, folk, and country forms into political and personal statements. On June 15, she releases her debut for Thrill Jockey Records, Cloud Corner. A meditative and peaceful album, the record serves as a respite from the constant noise of our modern times. We spoke with Anderson about the need for those kinds of musical spaces, the influence of science fiction on her work, and her subversive reinterpretations of traditional and public domain music. 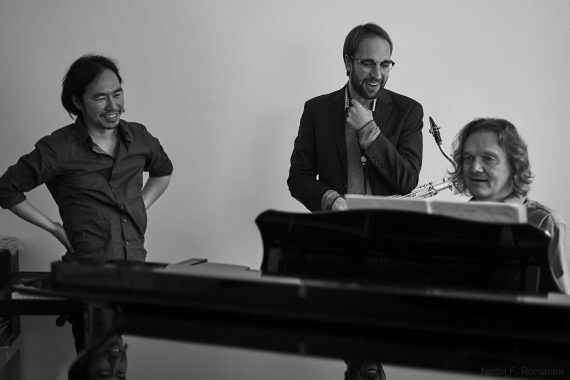 On its ECM debut, the Shinya Fukumori Trio crafts a stirring sound. Comprising drummer Shinya Fukumori, tenor saxophonist Matthieu Bordenave, and pianist Walter Lang, the trio’s For 2 Akis is an early contender for the sweetest sounding album of 2018. Recorded by ECM founder Manfred Eicher at Studios La Buissonne in the South of France, the new album is reviewed this episode by Leah Toth, an assistant professor at Hamden-Sydney College, and head of Footfalls Records, which has released music by Mary Lattimore and Elysse Thebner, Tashi Dorji and Marisa Anderson. Marisa Anderson’s music evokes space – wide open expanses – but to call it simply pastoral is to miss the mark. Anderson’s music is political and personal, and it’s cutting in its own way. This is true of her new album, Cloud Corner, which navigates profound tragedies – including a reflection on the Syrian refugee crisis – but also creates a space removed from the constant noise vying for our attention. We recently spoke with Anderson backstage at the Van Buren in Phoenix, Arizona, before her set opening for Godspeed! You Black Emperor. It’s very much a backstage recording – you’ll hear folks milling around, some clanking, a few kids running around – but it was a real pleasure to explore Anderson’s catalog and reflect on the stellar new LP.